Antique Gruyère Cheese for sale. Buy online at Zingerman's Mail Order. Gourmet Gifts. Food Gifts. Extra aging means more intense flavors. Just as Eskimos distinguish between a dozen different sorts of snow, the Swiss appreciate a wide range of Gruyères: young Gruyère, aged Gruyère, mountain Gruyère, summer Gruyère, winter Gruyère, Gruyère from small village cheesemakers, Gruyère from large commercial dairies. Depending upon season, source and age, the flavor and texture of the cheeses are significantly altered. Seventy-pound wheels are aged for over a year (at least six months longer than standard issue Gruyère), hence the term "antique." 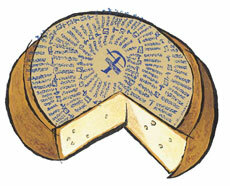 The extra aging gives this Alpine cheese an exceptionally full flavor. Imagine the flavor of the Gruyère you know now but ten times more delicious and infinitely more interesting. Smooth, with the spiciness of a great Rhine wine. It's got an incredible nose and a dry, yet creamy on the tongue texture. The wheels we're currently opening will win many fans to the side of Gruyère. It's rich and satisfyingly savory, with big, brothy bass notes and just a hint of spice that reminds me a little of a rich Rhone valley red wine.